Expansion joints for heating | SPA "Mariland"
Expansion joints for heating networks are designed to compensate for the generally axial displacements caused by thermal elongation pipeline. Expansion joints suitable for the channel, and for underground laying, reliable in operation and require no maintenance. Highly flexible bellows are the main component of the compensator providing compensation for large axial displacements. Durable casing and guides mounted on the compensator carry several functions, also protection of bellows from mechanical damage and increase the stability of the bellows, and compensate the possible misalignment of the pipeline. Directing tube is used to prevent turbulence (at high flow velocities in the pipeline system as well as to protect the bellows from being damaged by solid particles, often present in the coolant and settling between the turns of the bellows, preventing its operation. Expansion joints for heating systems and water supply of houses is used as a mounting element, compensating deformations from temperature changes. With a supply water temperature of 90°C and with a withdrawn water with a temperature of 70°C expansion in the pipeline is approximately 1 mm for each meter pipeline. Previously, to compensate for such elongations applied air pipe bends and taps, which was inconvenient, requiring additional costs, and eventually, does not look aesthetically pleasing. Expansion joints for heating residential buildings with the total compensating capacity of 50 mm (± 25 mm), it is recommended to apply the rate of one to 30 meters pipeline (approximately 10 storeys), by mounting in a straight section of the pipeline at a level between two fixed pipe supports. Installation of these expansion joints is easy. Even when installed in a place accessible for inspection, it does not attract attention to themselves at the expense of the small size and appearance. Such devices are perfectly suited for modern homes, hotels, offices, etc. Standard range of expansion joints for risers of multistory buildings designed for operating pressures up to 16 bar, has a total compensating capacity of 50 (+/-25) mm with a length of 260 mm products. SPA «MARILAND» Ldt. produces expansion joints for risers of multistory buildings with a nominal diameter of DN 20 to 100 mm for use at a nominal pressure PN 1,6 MPa. 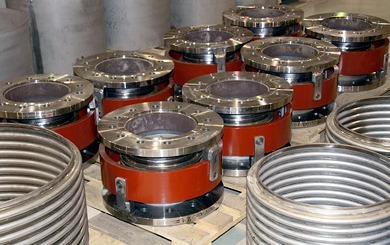 Expansion joints with a high ratio of length to inner diameter (d / L). Designed to operate at high pressures and provide a relatively large compensating ability. In expansion joints with such construction, the bellows loaded outside. Fluid pressure acts on the bellows in the area between the inner limiting ring bellows ring and an outer restrictive casing is not fixed to the inner pipe (on the right). Bellows of expansion joint conventional design, loadable from the inside, would lose centerline stability and deformed that would lead to its malfunction. If necessary compensation for large axial displacement pipeline, it is recommended to use a double compensator bellows and the intermediate pipe between them. SPA «Mariland» Ltd. produces axial expansion bellows in the casing with a nominal diameter of DN 100 to 1200 mm to operate at a nominal pressure of PN 0.1 to 2.5 MPa.